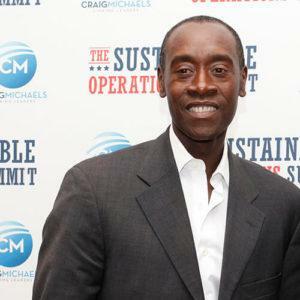 Academy award-nominated actor Don Cheadle (House of Lies, Iron Man 2 & 3, Hotel Rwanda, Traffic, Crash, Ocean’s Eleven) is one of Enough’s most active supporters. Don co-authored with Enough Founding Director John Prendergast the New York Times bestselling book Not on Our Watch: The Mission to End Genocide in Darfur and Beyond as well as the follow-up book he co-wrote with Prendergast, The Enough Moment. In September 2016, Cheadle joined George Clooney and Prendergast at a press conference at the National Press Club in Washington DC, to present the first investigative report of Enough’s investigative initiative, The Sentry. Afterwards, Clooney, Cheadle and Prendergast met with President Obama, Vice President Biden, Secretary of State Kerry, Secretary of the Treasury Lew, and National Security Adviser Rice to advance Enough’s and The Sentry’s agenda. Cheadle teamed up with poker champion Annie Duke to co-host the annual “Ante Up for Africa” poker tournament in Las Vegas. He also co-hosted a Prizeo fundraiser with Kristen Bell to support The Sentry’s work. Cheadle and Prendergast have co-authored numerous op-eds and have traveled with ABC’s Nightline twice to Africa to highlight our issues. Cheadle is a co-founder of the non-profit organization Not On Our Watch, which works closely with Enough.